The resl Colt Python is a .357 Magnum caliber revolver formerly manufactured by Colt's Manufacturing Company of Hartford, Connecticut. 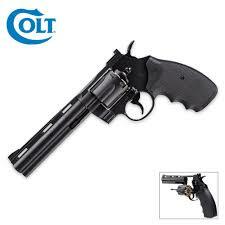 It is sometimes referred to as a "Combat Magnum". It was first introduced in 1955, the same year as Smith & Wesson's M29 .44 Magnum.